In the charming seaside town of St. Ives, a buried secret could bring an unlikely pair together for a lifetime . . .
Clara Anderson’s mother has one mission: to marry off her daughter to a titled gentleman. Unfortunately, though the Andersons have come up in the world, Clara is still the granddaughter of a pig farmer, which means no self-respecting aristocrat will marry her. That’s just fine with Clara, who’s grown to disdain the upper classes. So when she meets an attractive man even more common than she is, she decides it’s time to forge her own path . . .
. . . Except that handsome, rugged Nathaniel Emory, Baron Alford, is no more a commoner than Clara is a blue-blood. He’s appeared on the scene for one reason only: to save his family’s estate from ruin by finding the exceedingly valuable blue diamond his grandfather buried in the Anderson’s garden fifty years ago. To do that, he must pretend to be a gardener. He didn’t count on the most beautiful girl he’s ever seen getting in his way. But Clara has made no secret of her dislike for aristocrats. Which means that once she uncovers his ruse, he’s certain she’ll never see him again . . . Secrets almost destroy Clara's HEA. Nathaniel was not what he seemed, but he was want Clara wanted. A friendship grew into more, but the secret kept it from becoming more. I loved Clara's willingness to make her mother happy no matter what she had to put up with, showing how much she could love. I smiled as Nathaniel's single-mindedness shifted focus as he got to know Clara. The ending seemed a bit rushed to wrap everything up but left no loose ends. The story was good, and it was nice to see some secondary characters find their happiness as well. I received an ARC of this story through Netgalley, and this is my unsolicited review. A story of searching for a diamond but finding much more in the long run! Nathaniel Emory, Baron Alford has inherited an estate that desperately needs funds to maintain. Going off a deathbed confession of his grandfather, he has to find a rare blue diamond that he had buried in a garden in St Ives. Acting as a simple gardner he ends up at the home of Clara Anderson working in their garden in hopes to find the treasure. Clara has no use for members of the peerage but her mother wants her to marry a titled man. As Clara spends time with Nate, they begin to have feelings for each other. But of course, nothing is as it appears!! What will happen when she finds out he is a Baron? 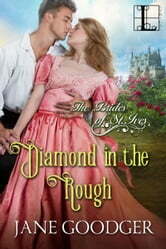 Will Nate find the diamond before someone else does? A really enjoyable story in The Brides of St. Ives series! !